I mentioned last week that I would be returning to the theme of that ultimate American hard liquor, applejack, for Thanksgiving weekend. 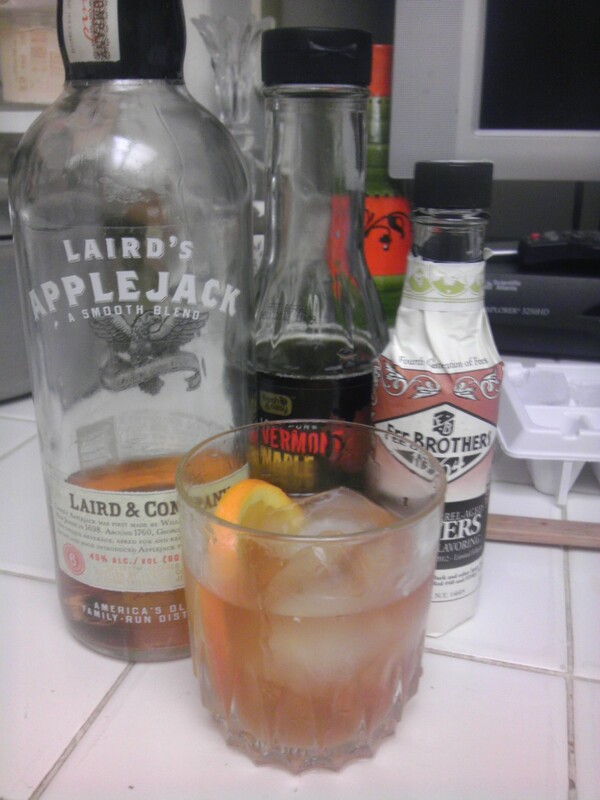 And, so, here we are — using the once ubiquitous apple brandy for a variation on the ultimate American cocktail. If anyone thinks I’m exaggerating when I refer to applejack as the ultimate American spirit, let it be known that no less a resource than Wikipedia tells us that a general named George Washington once asked a distiller named Robert Laird for the recipe for his brandy. The fact that today’s drink is made with Laird’s Applejack and not Washington’s Applejack either tells you something about General/President Washington’s famous integrity or his fear of early American intellectual property lawsuits. Regardless, it doesn’t really get more American than that…Unless someone can find an image of John Wayne knocking back some of that ol’ applejack. And, if the Duke were to order a cocktail made with the stuff, I like to think it would be made something just like this. 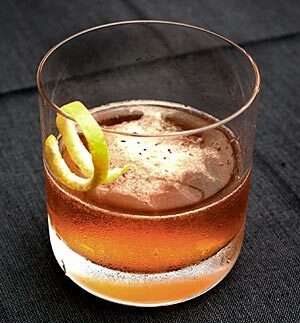 Start by muddling your orange slice in the bottom of a rocks/old fashioned glass. Add all the liquid ingredients and some very large ice cubes. Stir for a good long time to get a little water into the drink, and sip. Toast doing anything other than shopping this weekend. On the other hand, I know that orange muddling in Old Fashioneds is somewhat frowned upon in certain classic cocktail quarters these days, but I like my Old Fashioneds that way, gosh darn it. Also, cutting the maple in half and adding a bit of less concentrated sweetness from the orange seemed like the way to go for this particular drink. So did doubling the classic single teaspoon of soda water and bumping the carbonation up ever so slightly. The result was a really nice drink that is as U.S.A./American as drinks get, especially if you’re maple syrup is from Vermont and not from the oh-so-foreign climes of Canada. It is time to correct an old oversight this Friday the 13th. It seems that way back on the second DOTW, in which I dealt with that sturdiest of classic cocktails, the Manhattan, I failed to mention one of the most important of the classic variations. 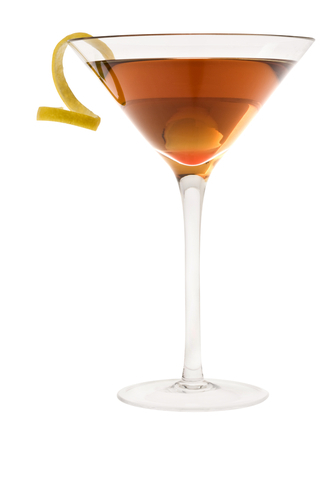 The Dry Manhattan eschews the usual sweet vermouth in favor of dry vermouth for what amounts to a very sophisticated drink that is essentially a whiskey martini for true cocktail snobs sophisticates. As far as I’m concerned, it’s nothing but good luck for whoever drinks it. The occasion for me revisiting this drink at this time is bottle of the very hard to find 100 proof version of Canadian Club that was very kindly sent to me by my personal good whisky fairy employed by Hiram Walker. It’s good stuff, maybe the best base I’ve found yet for this particular drink. We’ll get back to that later. First, the drink itself. Okay, let’s talk ingredients. First of all, I haven’t tried it this way lately, but I’m pretty sure this would also work with Scotch, though that would actually be a dry Rob Roy. Still, I’m of the opinion that Canadian whiskey in general and Canadian Club in particular might be better than bourbon and possibly even rye. I will say that the stronger, slightly more complicated and oaky flavor of the 100 proof version of Canadian Club might possibly work best of all. I’m really liking this stuff in general and I can’t wait to try it in a sweeter type of Manhattan. However, you should be aware that, at least here in the States, this stuff isn’t easy to come by even at your local big box beverage retailer. You can, however, purchase it online from select vendors, and I was able to find it just now for an extremely reasonable price at the website of Denver-based Argonaut Liquor. Of course, this drink will also work with the 80 proof stuff just fine. Especially if you’re going that route, you might well want to round up the portions to 2 ounces of whiskey and 1 ounce of dry vermouth. In that instance a second dash of bitters might not be the worst thing if you’re a bitters sort of person. Speaking of bitters, you’ll note that instead of suggesting the traditional Angostura brand of aromatic brew, I’ve given preference to the lesser known Fee Brothers brand. I recently picked up a bottle of this on a whim when I was visiting an unfamiliar liquor emporium far away from my usual digs and have kind of fallen in love in love with it. For my money, it’s flavor, though still apparently dominated by angostura bark, is a bit more subtle than its venerable competitor. It’s definitely tailor made for a drink like this which can’t stand up to too much straight bitterness, though regular Angostura will still work. I found using Regan’s Orange Bitters, however, to be a somewhat overpowering citrus experience when combined with the lemon peel. One final variation, if you’re as mad for olives as I am, you can really go the whiskey martini route here and using an olive or two or three as your garnish in place of the lemon twist. It won’t be anywhere near as good as this drink in terms of sophisticated complexity, but it will be olive laden. Sometimes, that’s all I need.